Smoothfoam is a great surface with many uses – it’s perfect for making a table decoration for any theme, like this shabby chic angel bride. 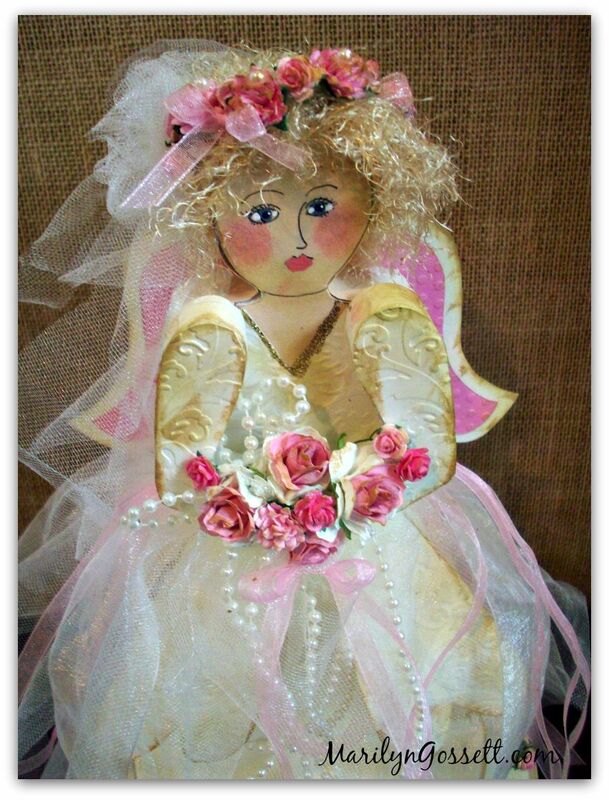 This angel can be adapted to many other holiday or seasonal themes in addition to bridal or wedding. I think she would be beautiful in Christmas colors; maybe holding a birds nest or something appropriate for the holiday. Enjoy! Emboss cream cardstock, then cut circles and strips to glue on the top and edges of each Smoothfoam disc. Ink the edges with light brown and glue the 6″ disc on top of the 8″ disc. Click here to print my pattern* for the angel bride shapes. 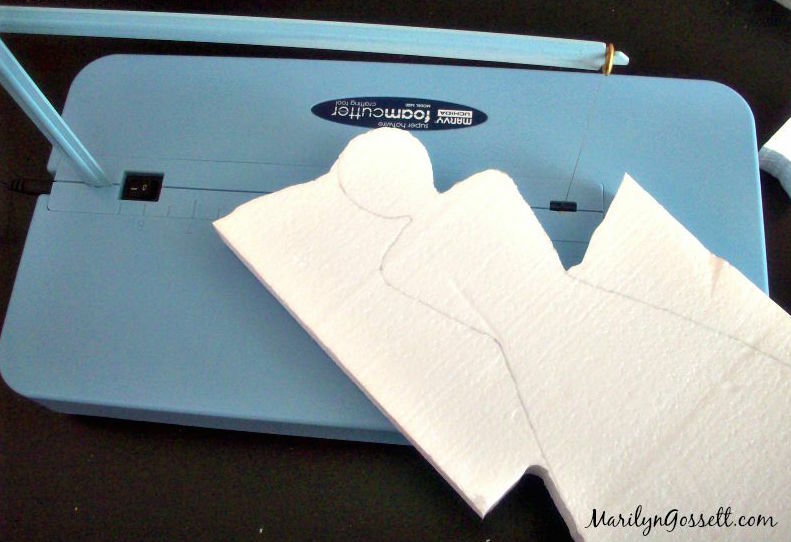 Cut out the pattern and trace around the body onto the 1″ Smoothfoam sheet. Trace the arms and wings on the 1/2″ thick piece of Smoothfoam. Use the hot wire cutter to cut out each shape. Trace around the head and shoulders onto the peach paper, cut out and glue the paper to cover the Smoothfoam. Outline her facial features with the marker. Paint her eyes blue and her lips pink. Blush the cheeks with the pink ink pad. 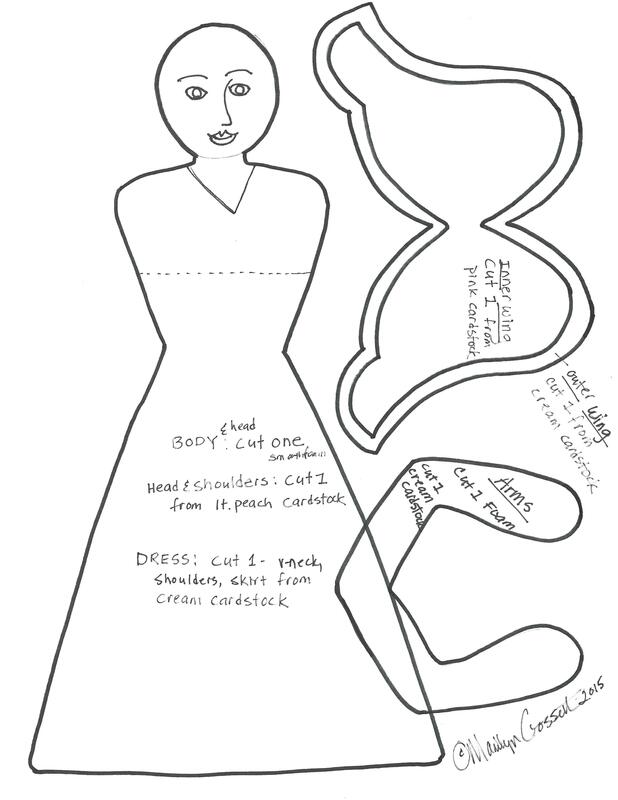 Trace around the dress and arms patterns onto the cream cardstock. Cut out and emboss if you would like to have textured pattern as shown in the photo. Glue the paper to the matching Smoothfoam shapes. Distress the edges using the ink and sponge. Cut out the wings from cream and pink cardstock using the pattern. Glue the layers together, then glue the wings to the angel’s back. Anchor the angel to the discs with toothpicks and glue. Glue yarn to her head for hair and trim as needed. Tie a knot in the middle of each strip of netting and glue each knot around her waist until you get the desired fullness. Glue flowers to her head, arms and base as shown. 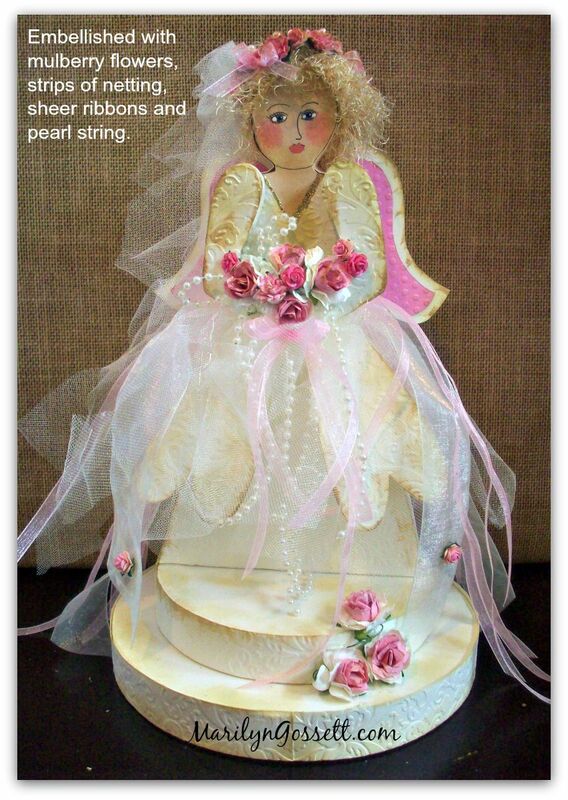 Further embellish with ribbons and pearlstring until you are happy with the way she looks. * My pattern is for your own personal use or gift/donation only. Reselling my design is a copyright violation. 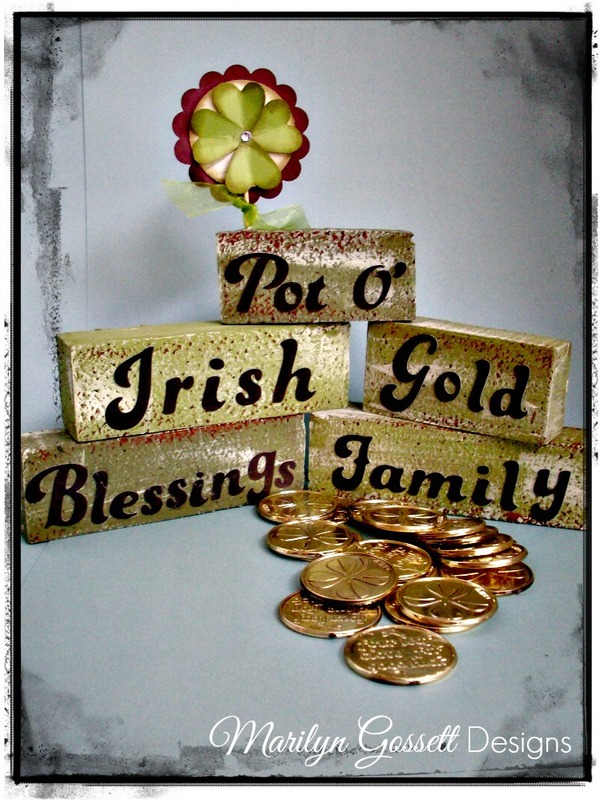 The Smoothfoam Scrapbook Page Mount is my favorite size and shape to use as a design base. 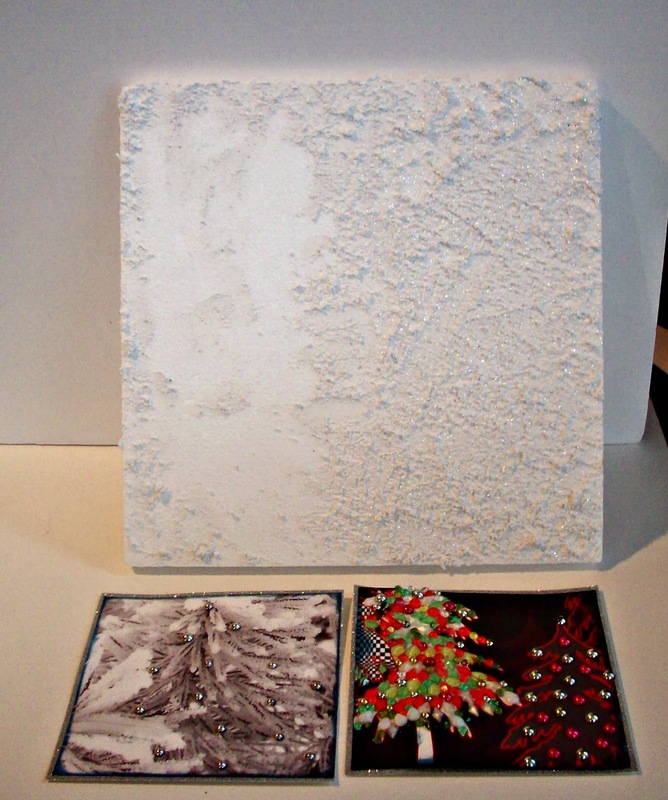 The possibilities are endless with Smoothfoam, plus it’s super lightweight for hanging on the wall or setting on a tabletop easel. Wrap the 15″ square of red burlap around the Smoothfoam sheet, mitering the corners, and glue the excess to the back. Center and glue the 11″ burlap square to finish the back and glue a small loop of narrow ribbon to the back for a hanger. 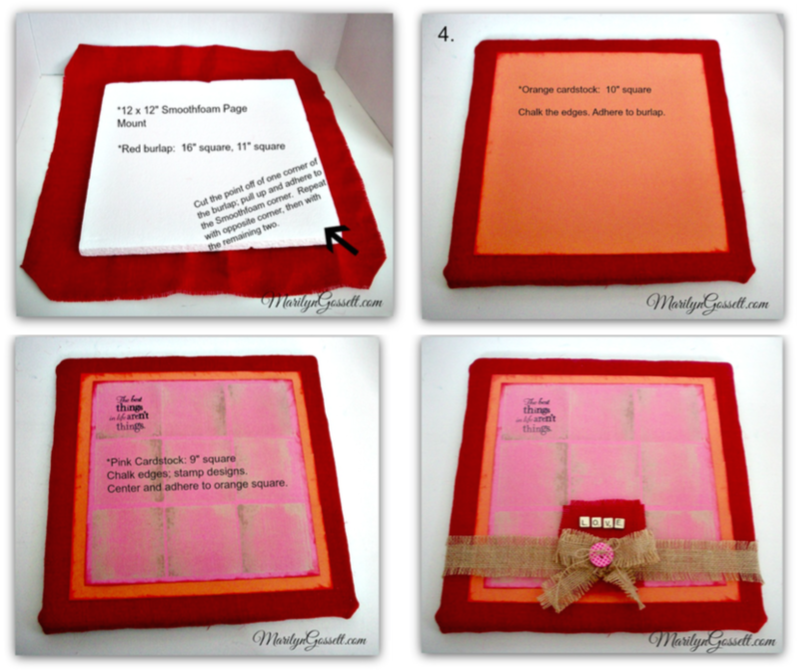 Stamp a background pattern on a 9″ square of pink cardstock, then stamp a sentiment in one corner. Ink the edges of the paper, then glue it in the center of a 10″ square of orange cardstock. Center and glue your matted image to the burlap-covered Smoothfoam sheet. 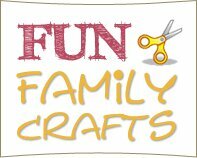 Wrap a 26″ length of burlap trim around the sheet and glue the ends in back to secure. Glue a burlap bow to the front as shown. Remove a strand from some scrap burlap, thread it through the button and tie it in a bow. Glue the button to the middle of the burlap bow. Tuck a piece of red burlap under the bow and glue the tile letters to the burlap. Arrange a selection of leaves and flowers, die-cut or punched from both solid and patterned papers on top of the pink cardstock as shown. 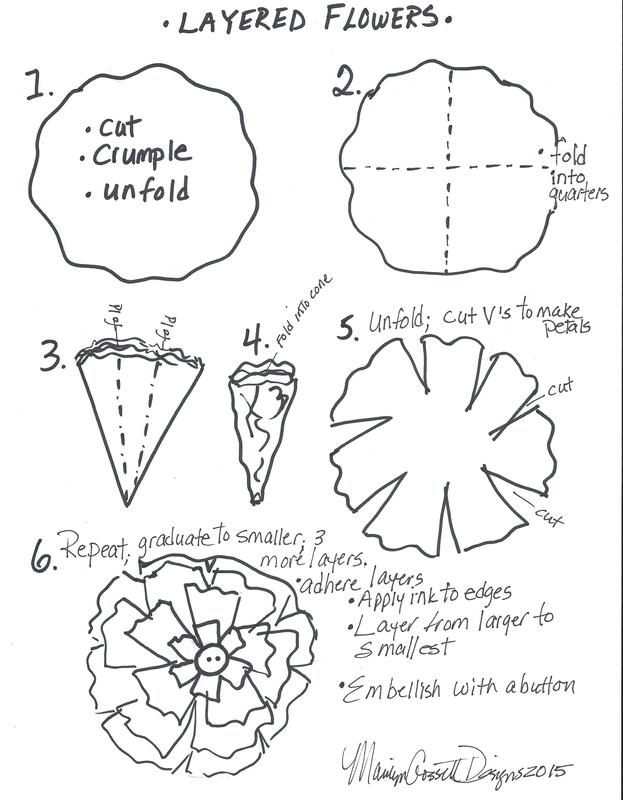 Click here to download my diagram for how to make crumpled dimensional flowers like mine. Ink the edges of each element for some more interest and depth, then glue everything in position with buttons in the center of each blossom. 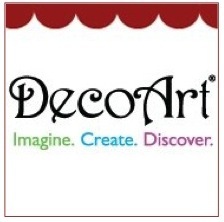 Need a quick gift or decoration for the graduation party? 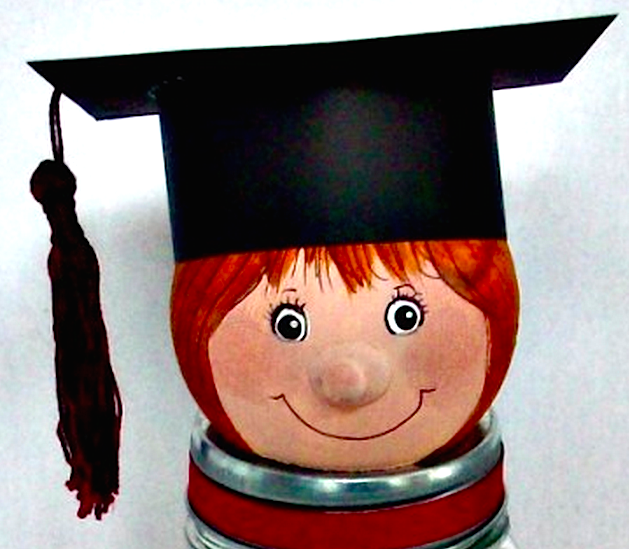 These DIY gifts for graduation are a fun idea that all your guests can participate in. Ask everyone to write down some words of wisdom for the graduate on little slips of paper, roll them up with ribbon and put them in the jar. A little money rolled in would be nice too! Congrats and best of luck to all the graduates! 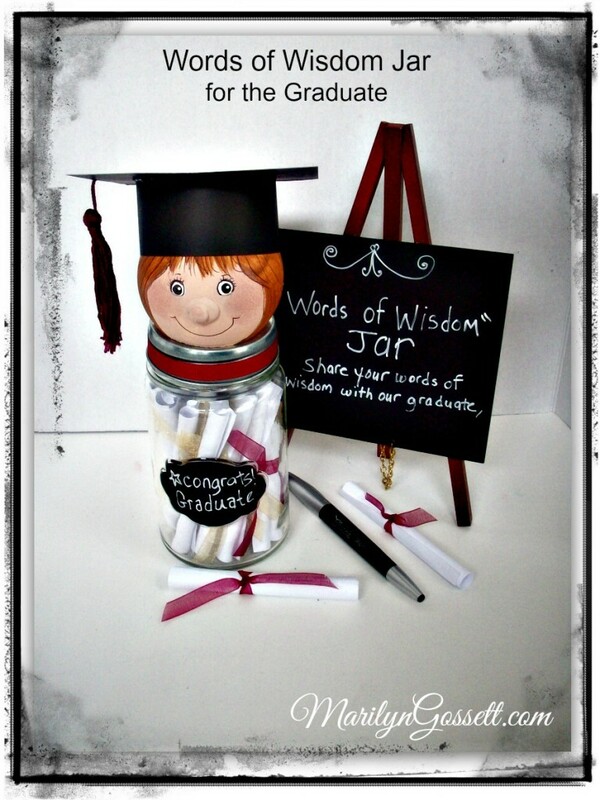 Learn how to make this Graduate Words of Wisdom jar below. Cut away the bottom of the Smoothfoam ball with the heat knife, leaving a flat surface. Add a small button-size puddle of hot glue where the nose should be. Let dry, then layer another smaller pearl of glue on top. Using the skewer as a handle, base-coat the ball with beige, let dry, then paint the face and hair as shown, let dry. Use a black marker to draw in the final details. Click here to download my face pattern to use as a guide. 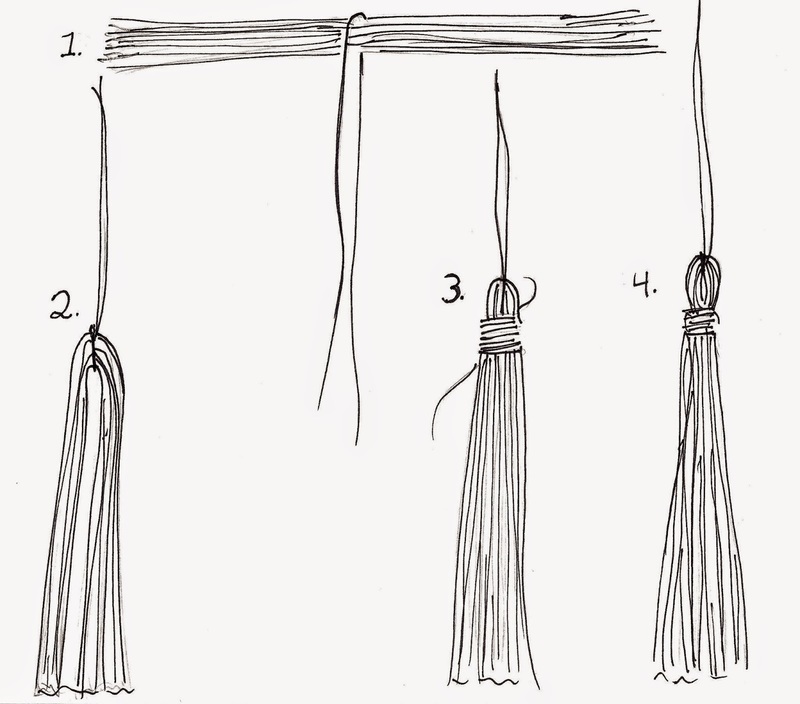 Make a tassel from a skein of embroidery floss – click here to download an instructional diagram. Glue together a square of black cardstock to a rolled strip of the same cardstock to make a mortarboard (see supplies photo above). Attach the tassel with a small round brad in the center. Glue the mortarboard to the head. Paint the embossed sign area on the front of the jar with the black chalkboard paint and let dry (or adhere a die-cut from chalkboard paper). Write a message or name on the sign with a white marker. Embellish the edge of the jar lid with paint or paper as desired. Here’s a cute idea for a handmade Mother’s Day gift – or this little ladybug DIY photo holder vignette could be adapted as a gift for a favorite teacher during National Teacher Appreciation Week (May 4-8). I think the ladybug could even stand on her own! Hope you are enjoying all of the new beginnings of spring! As you create this spiral wire photo holder, take time to enjoy the little blessings along the way and live life with a flourish! Disc (base) – Antique Green; 3″ half-ball (ladybug body) – red; 1-1/2″ half-balls – one black (ladybug head), three yellow (mushrooms). 2. Paint dots on the ladybug with the pencil eraser: White eyes on the head, black dots on each side of the body. Highlight the dots with a stylus and tiny cream dip dots. Attach the head to the body with a toothpick and hot glue to secure. I also used a dot of hot glue to form a nose on the ladybug’s face. 3. To make the spiral wire photo holders, cut three 12″ pieces of wire. Bend a tiny loop at one end of one piece of wire; continue to bend it into a flat coil to get desired spiral shape to insert a photo. Make a pilot hole in the middle of one yellow half ball. Poke the straight wire end through the pilot hole. Position the half ball and bend the wire back and forth just below the half ball. This will hold it in place. Poke the straight end into the green base. Use the wire cutters to cut the wire to the desired height. Repeat for each piece of wire and yellow half ball. 4. 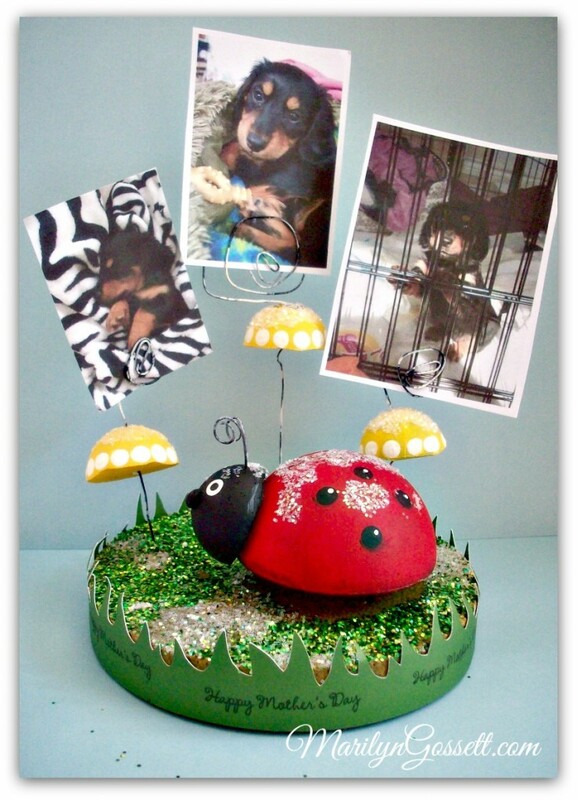 For the ladybug’s antennae, cut two 3″ pieces of wire. Bend the top end of one piece into a 1/4″ spiral. Repeat for the other piece. Poke into the top of the head. For her legs, cut four 3″ pieces of wire. Stick the front and back legs into the flat side of the red body. Push her evenly into the green base. 5. 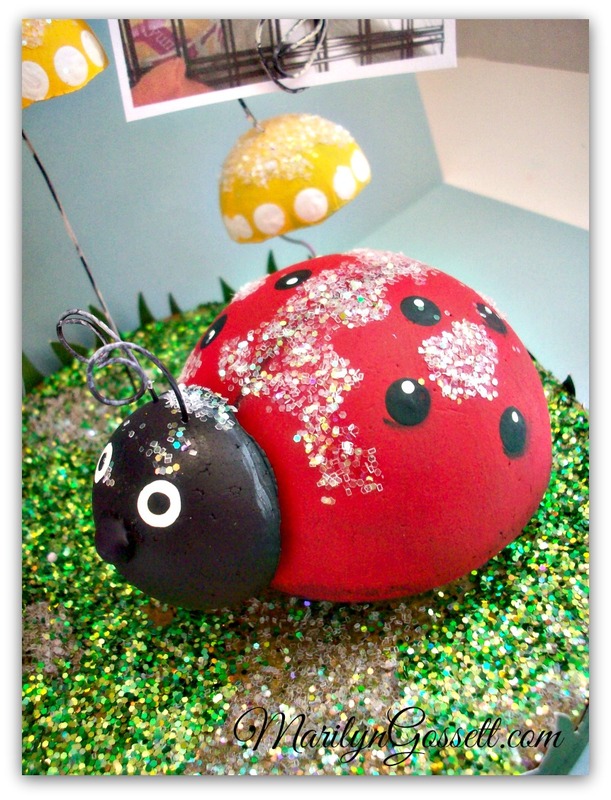 Embellish the ladybug, mushrooms and base with glitters and glue. 6. For the grass, I used my die-cutting machine and a grass border die to cut green cardstock to wrap around the base of my vignette. Another option is to cut two 1-1/2″ x 12″ strips of cardstock and cut a fringe at the top edge for the grass. Stamp a sentiment on the grass trim, then glue it to the Smoothfoam disc as shown. Easter is one of my favorite times of the year – it’s a time to reflect on the spiritual and a time of renewal. Easter bunnies and chicks show off the brilliant colors of spring and no matter what one’s age, the egg hunts, family dinners and fun times bring new memories and remind us of times gone by. 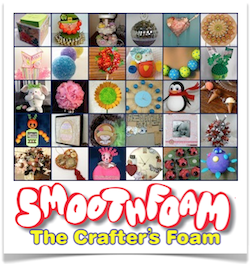 Smoothfoam is the perfect foundation for creating a vignette for your Easter decorating. 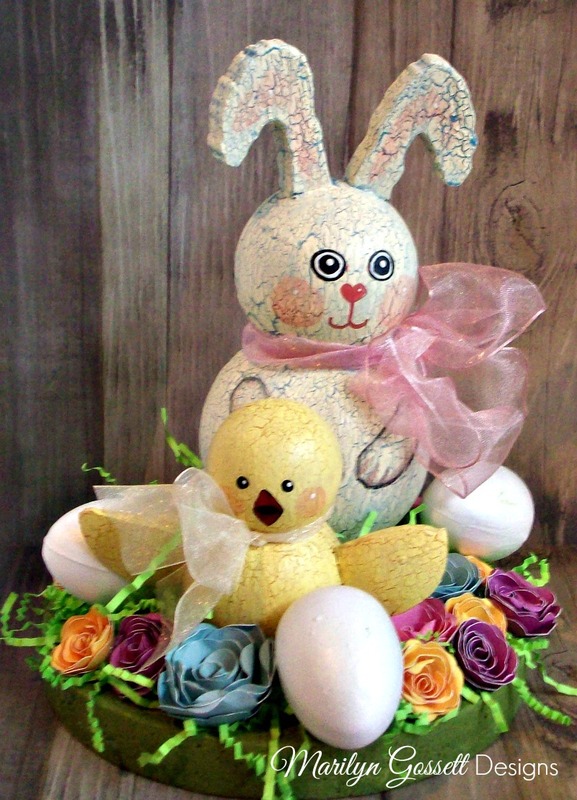 This Easter bunny and chick centerpiece will brighten up any spot for your Easter celebrations and beyond into the spring! Learn how to create your own DIY Easter centerpiece below. For the bunny head, position the 3″ ball with the pilot hole in the back. Trim off one rounded end to make it straight across. For the body, repeat with the 4″ ball, but trim both the top and the bottom of the ball. Connect the bottom of the head (flat side) to the top of the body (flat side) using a toothpick and a bead of glue. Cut bunny ears and feet from a 1/2″ thick sheet of Smoothfoam. Attach each bunny ear to the head with a toothpick and dab of glue. Do the same to attach the bunny body to the feet. Use the scraps cut from the Smoothfoam balls to make the chick wings. Attach to the chick using toothpick for each and a dot of glue. Base paint the bunny with Escape. Let dry. Apply crackle medium following the manufacturer’s instructions. Let dry; follow up with a coat of Whisper. Let dry thoroughly. Repeat for the chick with the Heritage shade. Paint the faces as desired with markers. Tie ribbons around their necks. Paint the Smoothfoam disc with desired color for the base of your DIY Easter centerpiece, let dry. Use toothpicks and glue to attach the bunny and chick in position on the disc, then embellish with eggs, flowers and paper grass. 1. Insert the skewer into the ball to use as a handle for decoupaging. 2. Crumple the tissue paper and spread it out, then tear it into small random pieces. 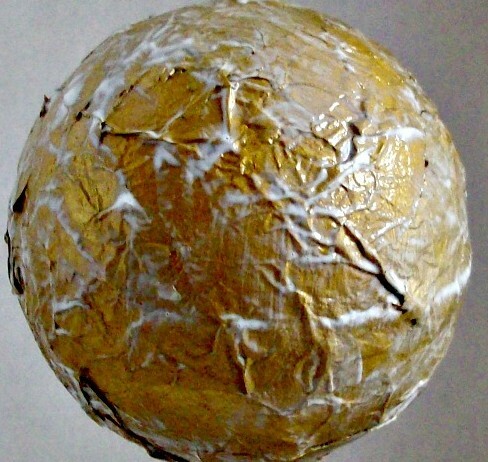 Brush decoupage medium to a small area of the ball and adhere a piece of crumpled tissue paper. Brush more medium to the top of the paper. Repeat until the entire ball is covered. Allow to dry thoroughly. 3. 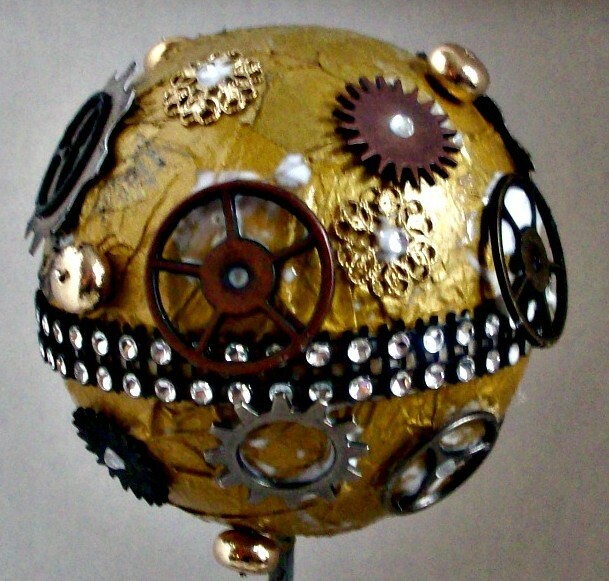 Rub the copper and black Metallic Lustre wax over the surface of the ball with a rag to add extra dimension and shine. Adhere the rhinestone trim around the middle of the ball. 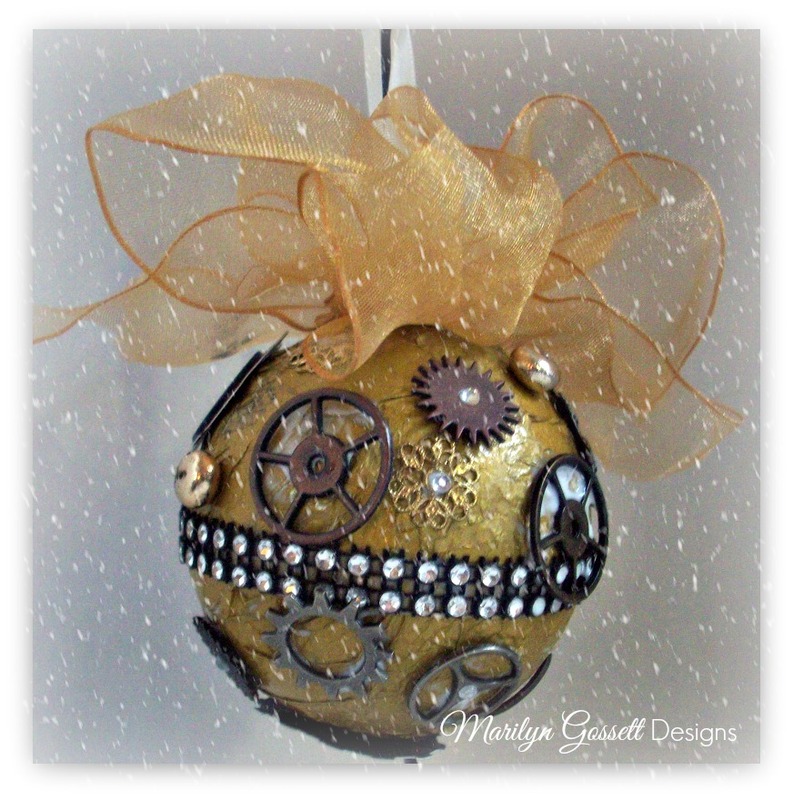 Glue and/or pin the other embellishments to the ball as shown. 4. 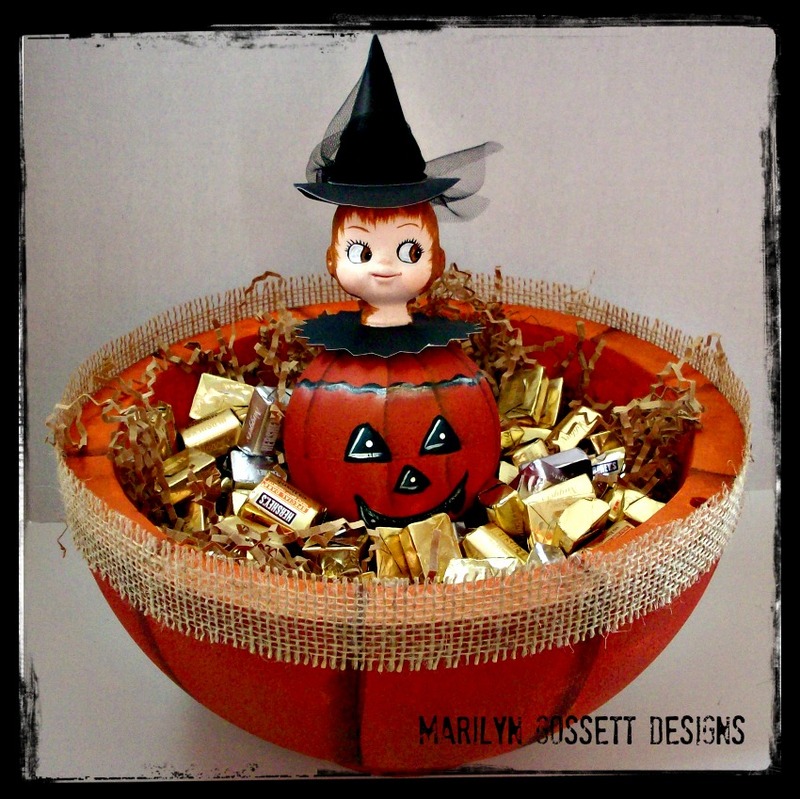 Make a bow with four 2″ loops and two 2-1/2″ tails from the gold ribbon. Trim a V-notch into the end of each tail. Tie the white ribbon around the middle of the bow to secure and glue/pin it to the top of the ball. Tie the white ribbon ends in a knot, leaving a 3″ loop for hanging. Trim the tails at an angle. Designer tip: Look through your junk drawer to find buttons, beads, old keys, metal washers and gears, etc. These items all lend to the steampunk effect. Enjoy & have a very Merry Christmas! Do you like to upcycle? I have a hard time throwing things in the trash sometimes, or even into the recycle bin! For example – the little Keurig coffee cups after they are used. I know there has got to be a really cool craft project lurking there, but I haven’t taken the time to figure one out yet. The box the cups come in was another story. I used it to complete this Jack-in-the-box Snowman project. It could be any kind of box with a flap, but this one was deep enough and worked nicely. 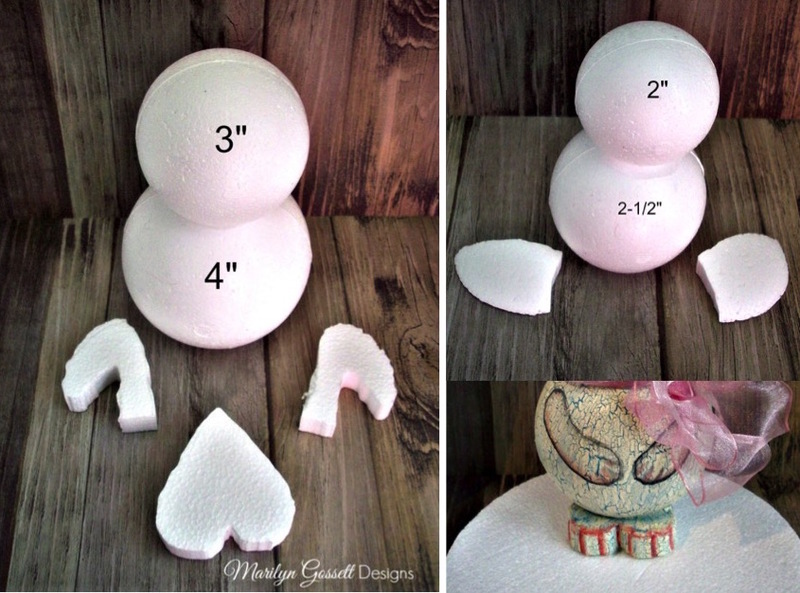 I hope you enjoy making your own DIY snowman decoration! 1. Measure the height of the box. Cut cardstock to fit the box and lid. Adhere papers to the box & lid using the Decou-Page medium, set aside to dry. 2. 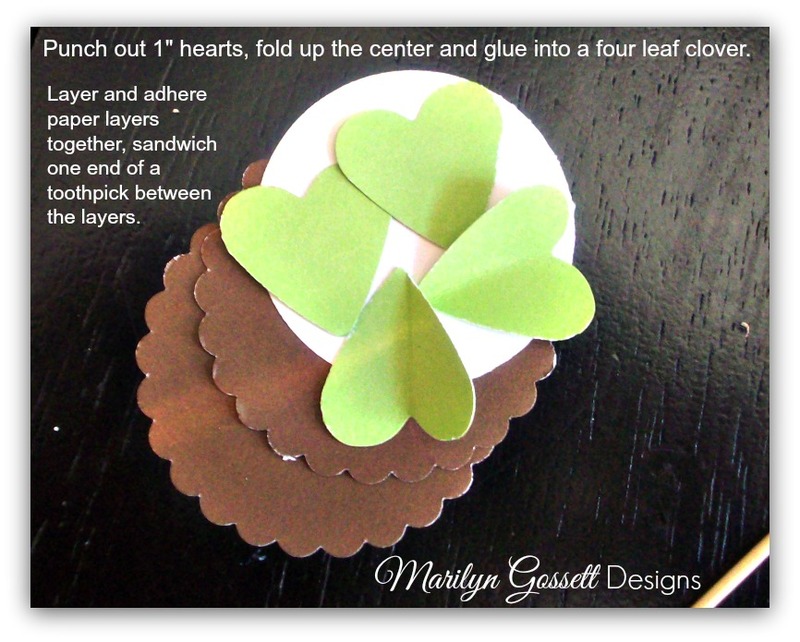 To make a rosette, cut three 2″ x 12″ strips of cardstock. Accordion fold each piece every half inch. It works best to score them before folding. Glue the two strips together and gather the folds into a circle and glue the edges together. Glue a scalloped punched circle of cardstock to cover the hole in the middle and secure the rosette. Repeat on the opposite side. Make one rosette for the front of the box and another for the snowman’s collar. The glue gun works best for making rosettes. 3. Fold one sheet of felt in half along the long edge. 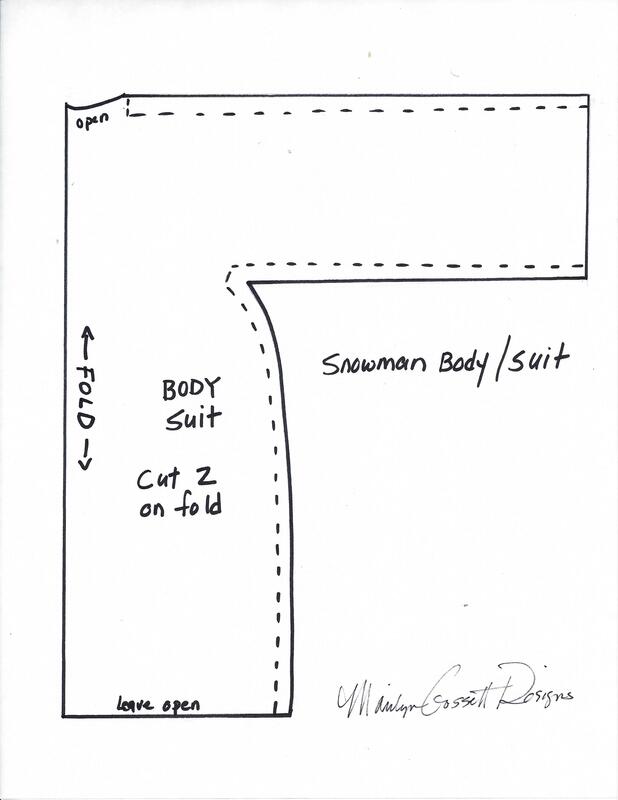 Use my pattern to cut out one side of the snowman’s body and repeat with the other sheet of felt. Glue all the edges of the body together; leaving an opening for the head. Once dry, turn the suit right side out, hiding the seams inside. Lightly fill the body and arms with stuffing. 4. 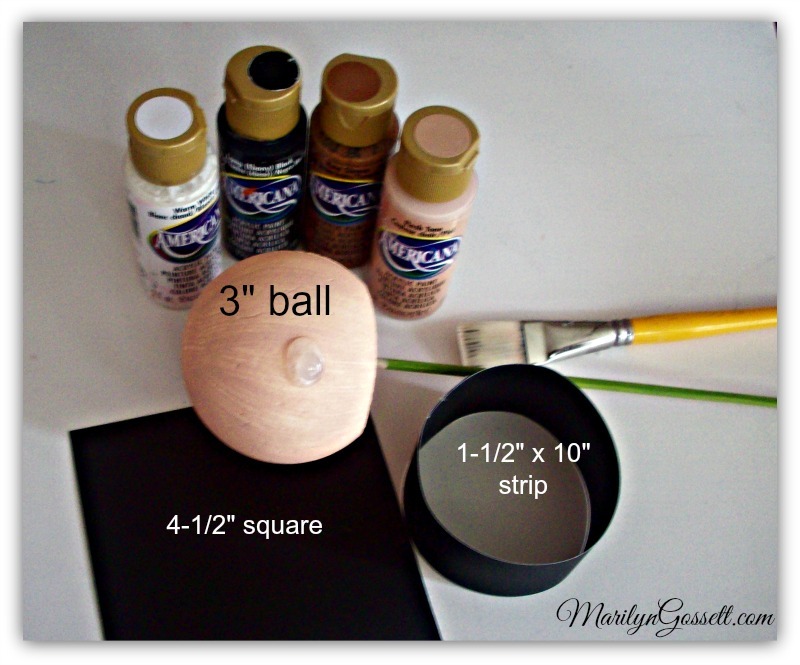 Paint the Smoothfoam ball Whisper Chalky White. Poke the skewer into the pilot hold at one end as a handle to hold while painting. Once the ball is dry, paint black dots for the eyes and mouth. Rub blush on the cheeks with your finger. Highlight the eyes and mouth with tiny white dots. Allow to dry. 5. 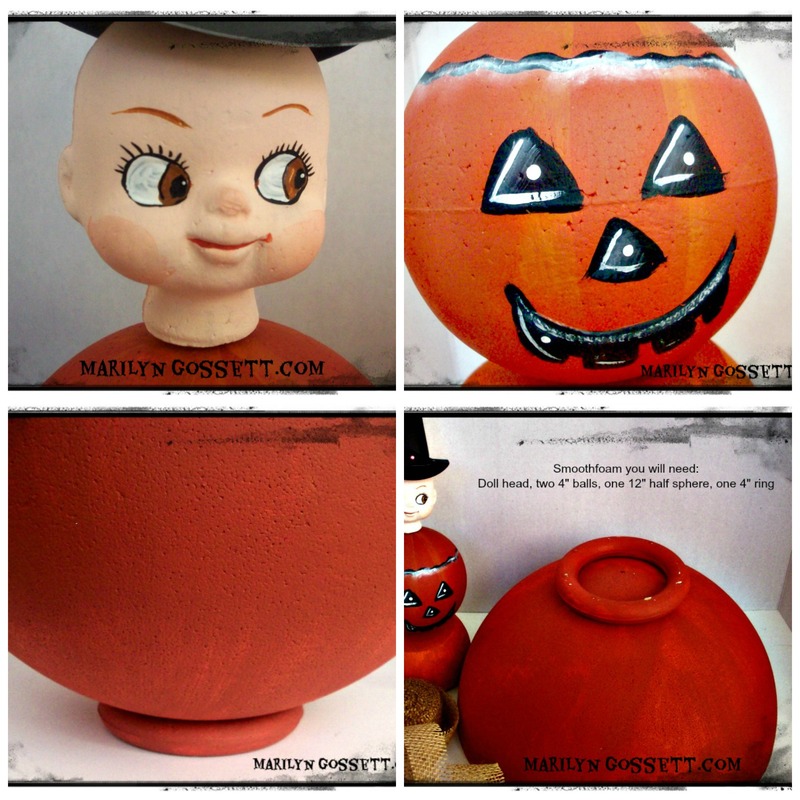 Remove the skewer and paint 2″ of the pointed tip orange. When dry, cut off the tip of the skewer and push into the face for his nose. Replace the remaining part of the skewer back into the pilot hole and set aside. 6. Pierce a small hole in the center of one rosette and poke the skewered head through the rosette and neck opening into the stuffed body. Spritz a little spray mount and sprinkly glitter to the head, rosette collar and body. Shake off excess. Place the snowman in the box with the arms extended as shown. 7. To make a crank handle, bend the silver metallic stem in two. 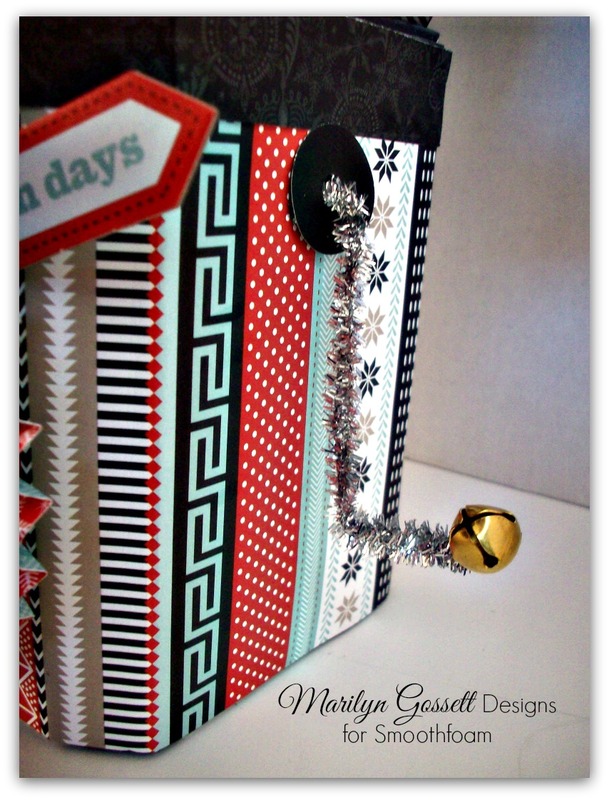 Shape it into a handle and glue the jingle bell onto the bent end. Make a pilot hole in the middle of a 1″ circle of cardstock. Push the ends of the stem 1/2″ to the back side of the circle and bend out like a brad. Glue to the side of the box. 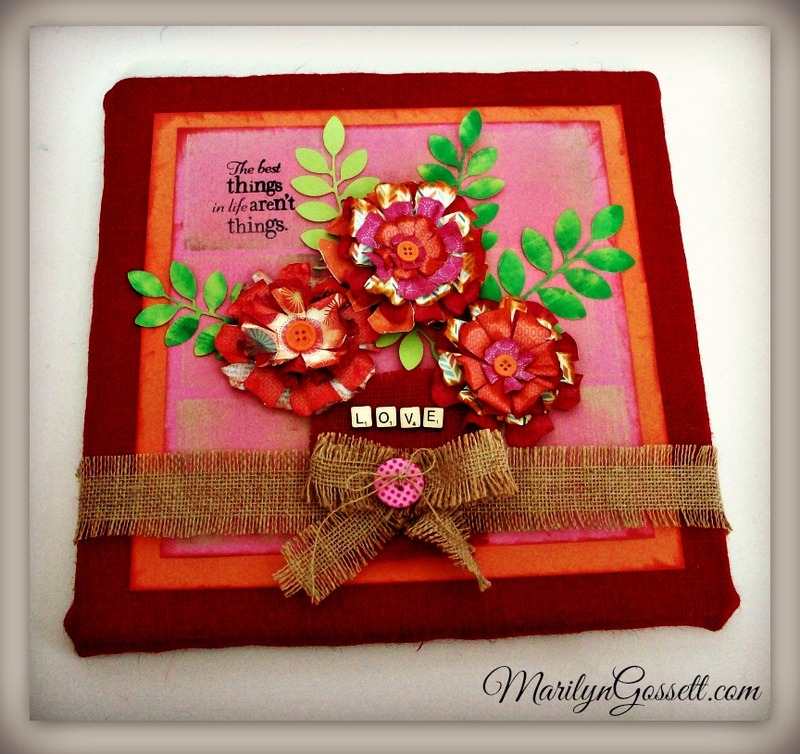 Glue the second rosette to the front of the box and embellish with die-cut sentiments. 8. To make a halo for his head, loosely twist the red metallic stem around the green stem. 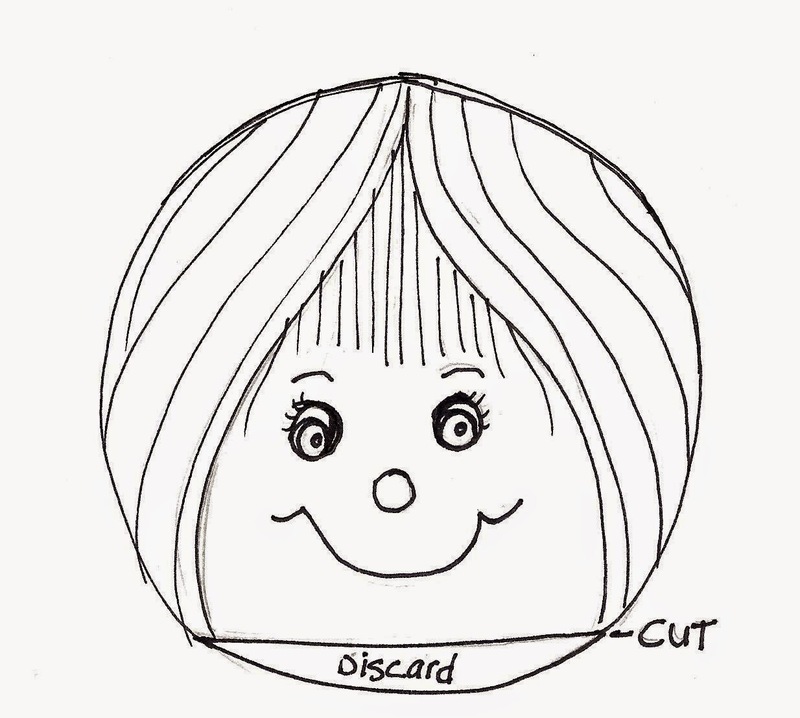 Make a circle to fit around his head and twist the ends together to secure and glue it to his head. Glue another piece of green stem to the collar for added decoration. 9. 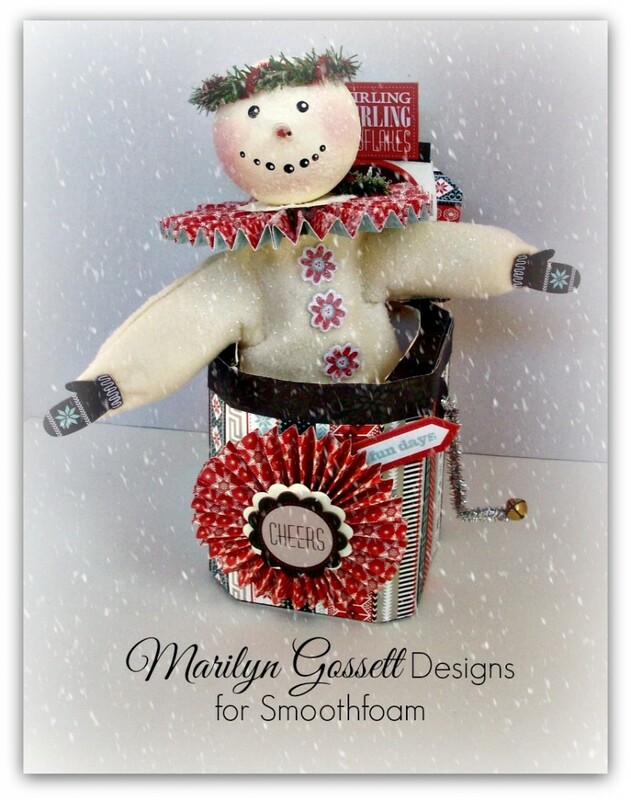 Embellish the snowman with stickers for the mittens, buttons on front, and sentiments. TIP: Use your diecutting machine or paper punches to cut embellishments if you don’t have the stickers. Rubber stamps will work for the sayings. 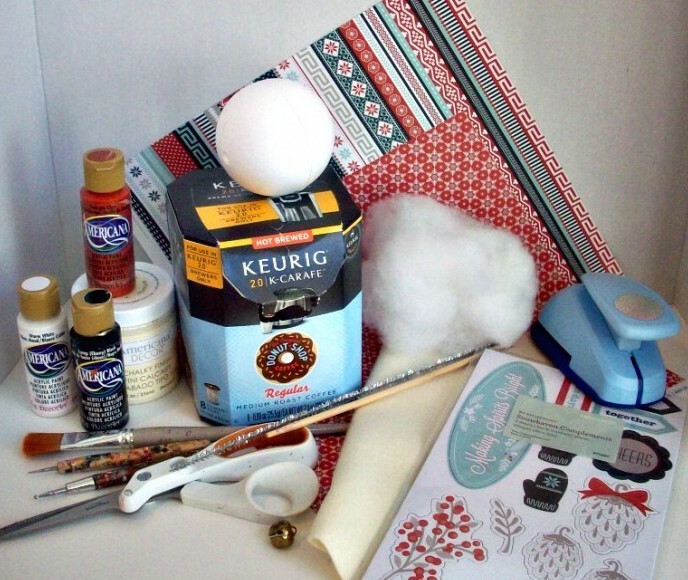 Now enjoy an adorable Christmas DIY snowman decoration that can stay out through January! Create your own snowman in a box today! 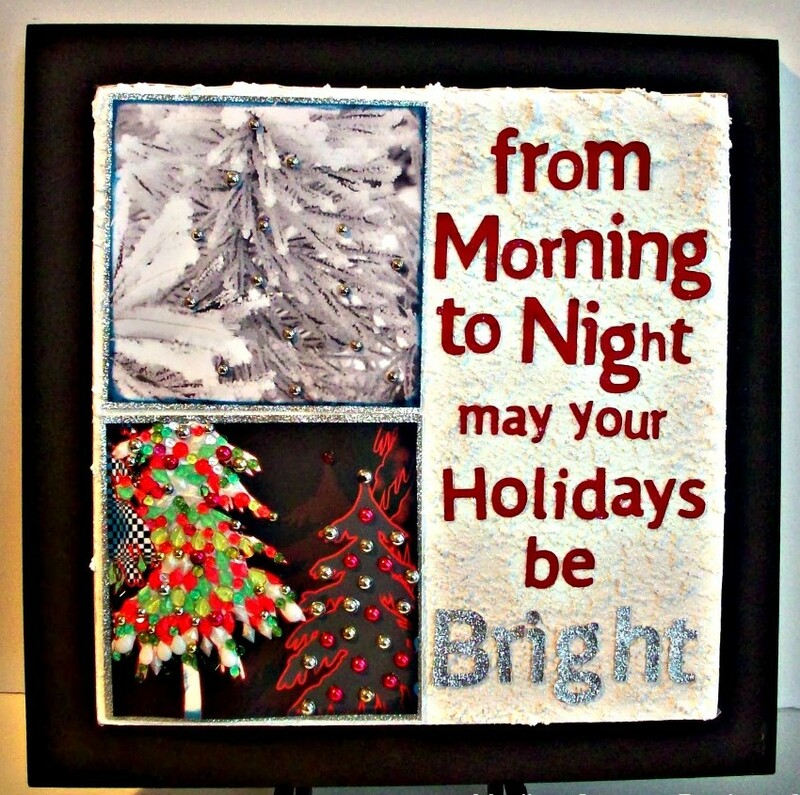 From morning to night, may your holidays be bright! This plaque is a holiday decoration you can keep up through the New Year. It can be hung on a wall or set on an easel. Put it where light can shine on the glitter to make it sparkle. 1. Apply Snow-Tex to the Smoothfoam sheet with the craft stick. Spread it as thin as possible and allow to dry. 2. Cut out the letters with the die-cut machine. The larger letters are 2-1/2″ high, the smallest are 1″ high. 3. 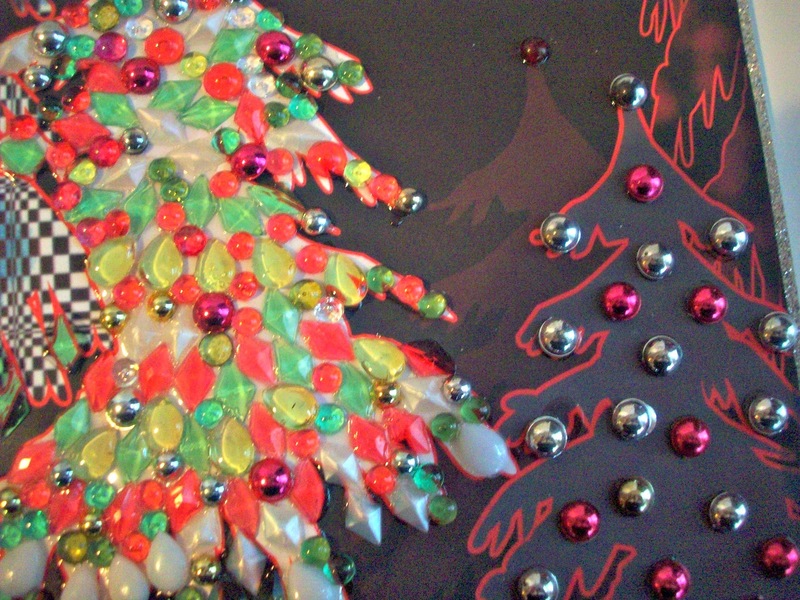 Accent the image on the holiday cardstock by adhering gems and allow to dry. 4. 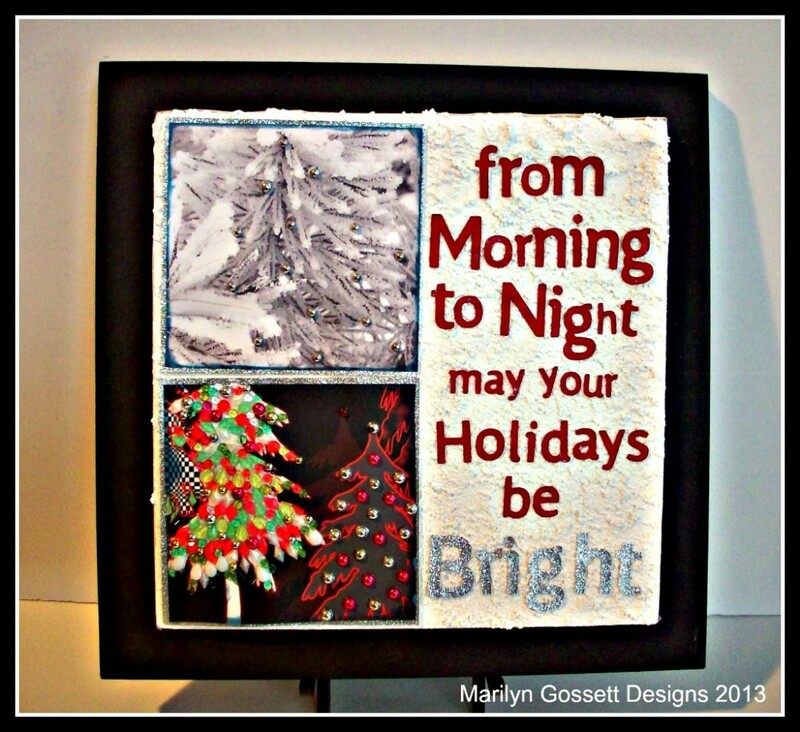 Glue each embellished square on top of a silver glitter square. 5. Arrange and glue all of the elements on the sheet as shown.